You've already taken the first step of documenting your find with lots of photos. The next step is based on whether or not you would actually wear/use something made with that particular fabric. If it isn't something you'd actually wear it seems wasteful to use it. Maybe just display it in your sewing area instead. I would only hang onto it if I didn't like the fabric/skirt pattern. Otherwise, I'm a user of vintage goods...I would TOTALLY keep the package and display it, but I would also make the skirt...then when anyone would ask about the skirt, I'd whip out the photos of the kit and the box itself and show it off. I LOVE finding mid-century stuff still new because it means *I* get to open it and love it as though I just ran to the store and bought it. I have just found something similar in a box of fabric and sewing supplies I bought this week. It's a mail order dress kit from a (1960s I think) UK magazine. All the fabric is pre-cut and it comes with zip, buttons and instructions in the pack. I'll watch the feedback you get with interest because I'm about to face the same dilema. The kit is cute, but even if you like the fabric, cotton gingham is easy to come by, so you could easily create the look without using the fabric. Also, you probably don't even want a metal zip in a skirt - plastic coil will wear better and vintage zippers may rust. I vote trace the pattern and recreate with modern materials. I vote use/make it - the pattern is cute and the fabric sweet but what really really makes it stellar is the whole idea of it - it's like a long-lost memory that you can wear! You know what would be cute? Make it and take a photo and use the packaging as a mat - put the picture where the fabric shows through now! I love it! Who knew something from Sears could look so hip? I couldn't bring myself to use it. I'd want to, but I wouldn't be able to. I would sooooooo be trying to find another one so I could sew one and save the other lol! Nah, I'm not a packrat - why? That is by far and away the cutest thing I've seen in ages. I think you should go ahead and use it, but like other people have said, keep the kit packet etc to display. I'd feel so cool wearing a skirt like that knowing its little piece of history. Thanks, everyone, for all the great suggestions! Two things that really stood out for me - Katie's suggestion that modern materials might make a better skirt; and LaDonna'a comment that making it if I'm not going to wear it would be a waste. So, I think I'm going to make up a copy. And then based on that, I'll decide if I'm going to make up the real one. I'll keep you all posted! Aww that's the cutest thing ever! Don't use it!! You can make that style of skirt really easily and the fabric is easy to find. 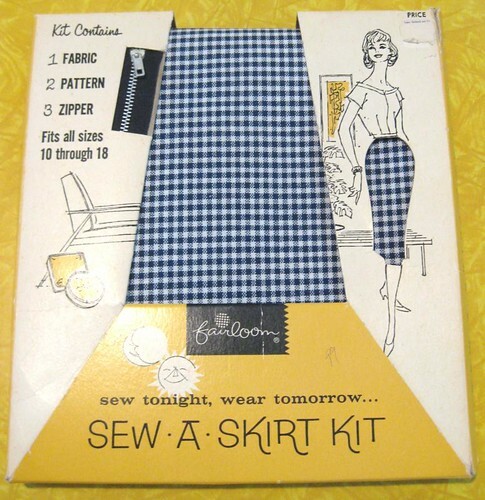 Your skirt kit is much the same - any vintage skirt you purchased - or even fabric to make up same - would probably cost more than what you paid for this kit. And there's the extra-coolness factor of being able to wear such a unique skirt. So I'd say go ahead and make it up - you've already taken the pictures, anyway - and then frame the packaging and put it on display in your sewing room! I know it is just me being the way I am, but I would probably never open it (especially since it is such a common style of pattern). I'd hang that sucker on the wall like a prize! I would not use the kit. I agree with the suggestion that you trace the pattern and make up the skirt in modern materials that reflect your taste and wardrobe. 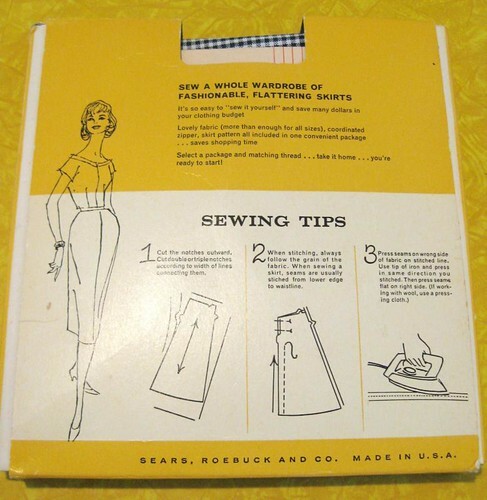 This kit is a little bit of sewing history and if you use it up, it is gone. An empty package no longer has value. I would love to find a PERSONALITIES purse kit from the 1960's, but can't and my frame is gone. Once it's gone, it's gone. I think the kit is a great idea!